Repatriation Ceremony for Unmunsa Temple Painting of Chilseong was held at the Memorial Hall of Korean Buddhist History and Culture on April 13. 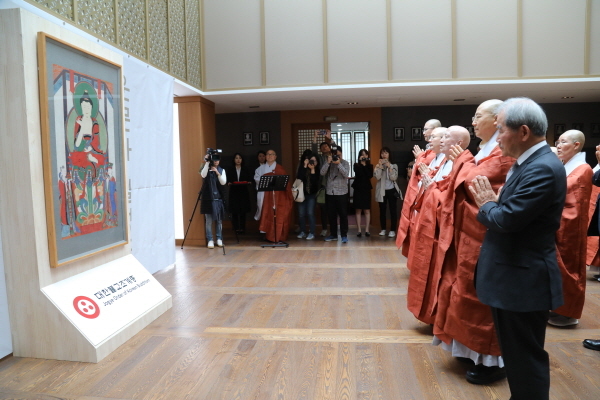 The Painting of Chilseong was repatriated to be returned to its original site, Unmunsa Temple in Cheongdo through active and close cooperation between Jogye Order of Korean Buddhism and Overseas Korean Cultural Heritage Foundation. Last February, Overseas Korean Cultural Heritage Foundation discovered the painting while monitoring Korean cultural artifacts being auctioned overseas, and identified the painting and its site of origin. Through studying the inscriptions on the painting, the foundation discovered that the painting was originally displayed in Unmunsa Temple in Cheongdo and that it was paintied by Ha-Eun Uisang, a prominent painter and monk of 19th Century from Gyeongsang Province. The Unmunsa Temple Painting of Chilseong was purchased at an auction by Bonhams New York on March 21. The painting was returned to Korea on April 11 and it is planned to be displayed in Unmunsa after today’s special exhibition. The repatriation was possible due to active effort of Unmunsa Temple and close cooperation of the Order with the temple, the foundation and relevant institutions. The occasion has become an example for further cooperation between Department of Culutural Affairs and Jogye Order of Korean Buddhism and Overseas Korean Cultural Heritage Foundation to repatriate cultural relics from abroad.